The rise, fall or stability as a club depends on money. Look at PSG, a club that is less than 50 years old, but in the last 5, have become a prominent force. Lose your financial life line, and your lose you'll status. 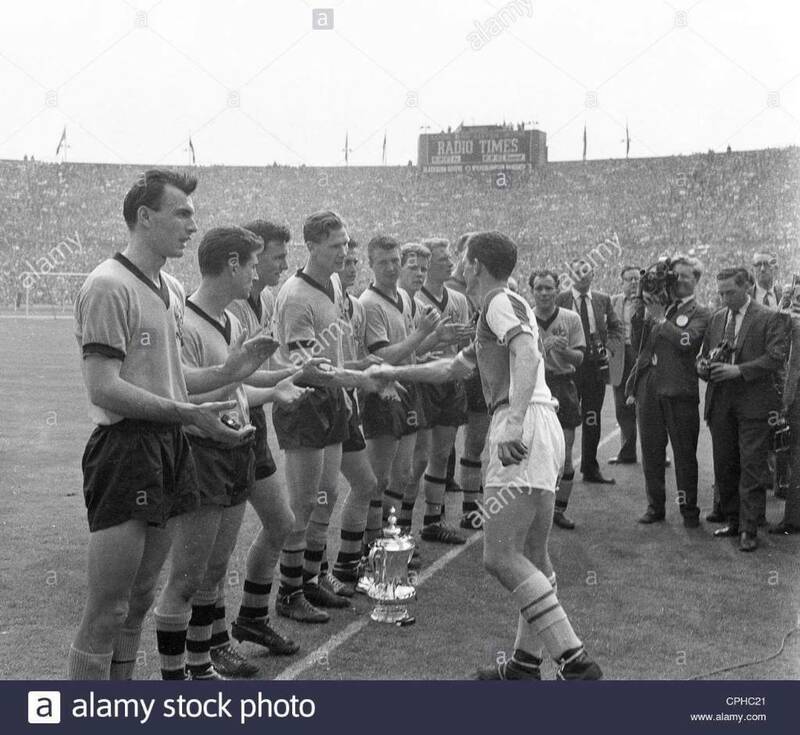 Blackburn Rovers captain, Ronnie Clayton congratulates the 1960 FA Cup winners, Wolverhampton Wanderers. That is a blast from the past that I'd forgotten about. How modern it all looked in those days. The players spent about a third of their time training in the upstairs indoor football pitch as they did at Castlecroft. And another third running up and down the South Bank on the orders of McGarry who issued punishments if they didn't keep up. Got no time for McGarry mate, I remember the skill work by Ronnie Allen. players like Farrington, Evans, Lutton and Walker spent hours in there. Evans was sold for a goodly price but the others didn't do much and they were reputed to be the next generation. I saw Farrington a few times but he didn't light any fires. I spent hundreds of hours in there too. Novus Badminton Club moved there from WGS and became Wolves BC. Practice nights Monday & Friday, and matches other midweek days. Happy happy days!!! Also used Social for fund-raising nights for Wton Schools FA trip to States in 1978.... Sludge Lees..... Urgh!!! Had a fair few wetties in there as a young lad....was a very good club..cheap too. The front of that building was also the players car park. I loved that umbro shirt. Just a few thoughts on that 1978 squad. It had reached the end of its cycle, the Ronnie Allen signings had passed their sell by date while the acquisitions through the seventies had been poor and substandard. The scouting had gone to pot through this decade while the youth system were producing fair to good players rather than good to excellent. There was a complacency, a manager Chung who was to close to the players and not ruthless to make the required cuts. The writing was on the wall for what was about to happen during the next decade. The guy standing extreme left has a very, very famous sister. And don't you just LOVE those tracksuit bottoms! Following on from KK's thoughts, only 3 years earlier we were F.A youth cup finals..the lads signed in the 60's were getting older and Daley's head was starting to be turned. For me you can't under estimate the "loss" of Daley, but apathy was every where from the team, to the ground, facilities, and the board..Wolves have never built on success. It's only taken 40 years. Worked with Kevin for a few years. The Wolves board and management wouldn't survive the scrutiny of the modern day, it lacked about half a million pounds of investment. There was no direction and very few questions asked. If you look at the photograth of that Wolves squad you could easily cut 15 from it who were not adding sufficient quality. Ones to build around, 4 on the back row, 3 in the centre and 2 on the front row. During the winter of that season the seventies Wolves version of Jota had been sold to Arsenal, Wolves never got to grips of how to use him. Fans and local newspapers didn't ask questions in those days and just expected the people in charge to know what they were doing. I remember Alan Sunderland absolutely running rings around the opposition (I think Oldham) on a very icy pitch one day. He seemed to be the only one who could control the ball in those conditions. Looking back did the board choose right with Barnwell, should they have ignored him and just hired Barker? Looking back five/six more years of Steve Daley or Andy Gray? You may know better than anyone, I'm not sure what the link was between Barnwell and Barker. Both were managers at other clubs, so I'm not sure how their paths crossed. And I guess Barnwell came first, IMO they worked well together, when the world was looking at how it was being done in the East Midland's. For me, I'd keep Daley, over Gray, although I liked Gray.